The Newnan-Coweta Chamber of Commerce was named the 2015 Chamber of the Year in its category by the Association of Chamber of Commerce Executives (ACCE). Chamber of the Year is the nation’s only award recognizing the dual role chambers have in leading businesses and communities. Those honored with the Chamber of the Year designation have demonstrated organizational strength and made an impact on key community priorities, such as education, transportation, business development and quality of life. The award represents “a true team effort,” Boothby said, adding, “I’m so happy the work of our volunteers, members and staff is being recognized." Qualifying for Chamber of the Year is a rigorous process. Chambers compete based on meeting key performance criteria on the ACCE Annual Operations Survey. Qualifying chambers then enter the competition with a written application addressing all aspects of organizational operation and programmatic work. Finalists then participate in a judges’ panel interview, the third and final round of competition.To ensure the fairest competition, applicants are grouped into five categories based on: annual revenue, membership, area population and several other factors. There are more than 7,500 chambers nationally. Out of the 33 chambers nominated, the Newnan-Coweta Chamber competed with chambers not only in the United States but also Canada and Europe. 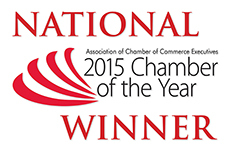 The Newnan-Coweta Chamber is the first chamber in Georgia to be named a National Chamber of the Year. Applications are scored by peer chamber executives to determine finalists. Winners are selected from among finalists based on an in-person interview before a panel of experienced chamber professionals. Recognized in the TOP 1% of chambers nationally, The Newnan-Coweta Chamber is a 67-year old pro-business, advocacy organization serving more than 1,000 members. Boasting an impressive history of strong results, this 5-Star Accredited chamber is one of only 95 chambers nationally to have earned a 5-Star designation. Accreditation with the U.S. Chamber of Commerce is a prestigious honor that distinguishes the high quality, expertise, and strong leadership displayed by accredited state and local chambers of commerce. There are 7,022 chambers in the United States with only 207 of these chambers accredited and only 95 recognized as 5-Star chambers. Chamber Staff and Volunteers received the 2015 National Chamber of the Year award in Montreal, Canada.